If you have a smartphone or tablet, odds are you play Angry Birds. From the classic app to new incarnations like Angry Birds Star Wars, these birds are determined to rid the world of those mean pigs. Hasbro has joined forces with Star Wars to launch several new games. Here are some of my family's personal favorites. Are you ready to play on Family Game Night? Who will reign supreme? The birds are ready for battle in the AT-AT ATTACH BATTLE GAME. The 12 ANGRY BIRDS STARS WARS are ready to destroy the Imperial Pigs. Stack the blocks and pieces together to create an AT-AT. Use the LIGHTSABER launcher to hep the Rebel birds conqueror the pigs. After you play the game, use the special in-pack code to unlock additional app content. This game retails for $19.99 and is recommended for ages 5 and up. What is the most fun part about Angry Birds? Knocking those meddlesome pigs of their perch.Now that you have mastered the app, it is time to put your real-life skills to the test. The Angry Birds Star Wars Millennium Falcon Bounce Game brings the knocking action to your living room. Who will knock the sinister swine of the Empire off the Millennium Falcon? Will the Rebel hero birds bounce into the cockpit? Put your precision to the test with each round. The object is to knock over pigs, land in the center target or land in the cockpit. 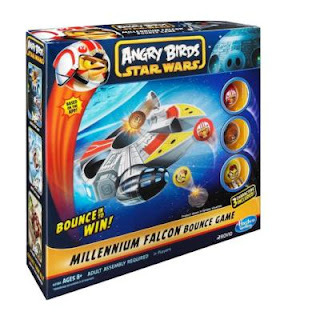 The Angry Bird Star Wars characters can take flight in your back yard. These Foam Flyers, are soft, squeezable and tons of fun. There are several different characters available. This toy is recommended for ages 3 and up. It retails for $9.99. 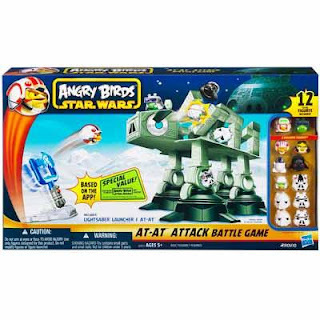 Are you ready to battle all the Angry Birds Star Wars games by Hasbro? 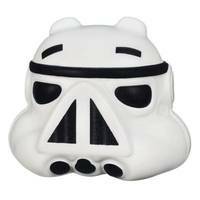 I have an Angry Birds Star Wars prize package to give one of my readers. Use the Rafflecopter to ener. Disclosure: I received these products to review and to giveaway. All opinions are my own. I don't know the names either but like the red one. The red one is my favorite. I like the yellow bird.